Carlo Ancelotti today confirmed that Branislav Ivanovic and Frank Lampard will start against Wigan Athletic after the Serbian defender recovered from a stomach problem and Lampard completed a full week of training after his goal scoring appearance last weekend. New signing, the Brazilian international Ramires will have to wait until our home match with Stoke before making his Blues bow after rejoining the team for training today. In other injury news, youngsters Jeffrey Bruma and Gael Kakuta will be sidelined for several weeks with Bruma having surgery this morning on a hernia problem and the young Frenchman having a back complaint assessed. There was good news however as the manager confirmed that long term absentee Jose Bosingwa will train with the first team squad next week at Cobham and should be ready to play in 2-3 weeks. With the clubs announcement yesterday that 21 year old defender Sam Hutchinson would be retiring from professional football, the Blues boss had some words of support for the talented young man. 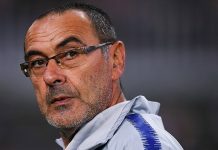 Head over to the CFCnet.co.uk forums to have your say on the managers views and all the build up to tomorrows big kick off. Next articleTHE OFFICIAL LINE – WIGAN WARNING & SAM HUTCHINSON RETIRES.